In the square behind Government House in downtown St. Augustine stands a monument and obelisk in memory of a most unusual Floridian, William Wing Loring. Boy soldier in the Florida Militia during the Second Seminole War, Brevet Lieutenant Colonel in the war with Mexico, regimental commander in the Far West, Major General of the Confederacy, and Pasha of Egypt: Loring was all of these. Loring was born in Wilmington, North Carolina. His family moved to St. Augustine, Florida, when he was three years old. His phenomenal military career began as a volunteer in the Florida Militia in 1832, when he was barely 14 years old. He saw considerable fighting in the early stages of the Second Seminole War, where he earned the sobriquet “Boy Soldier” from the local press. Promoted to sergeant, later lieutenant, of the militia, he ended his participation in the war to do what young men are supposed to do at his age, go to school. After attending school in Virginia, he returned to Florida and served in the new state legislature following Florida’s admission to the Union as a state. Loring wasn’t entirely happy as a politician, and when it was announced that the national government was raising a regiment of mounted volunteers for service in Oregon, he volunteered and was appointed captain of the new regiment. The outbreak of the war caused the regiment to be diverted to Mexico, where it, and Loring, served with distinction with General Scott’s expedition into the Valley of Mexico. Loring was breveted three times for bravery: at Cerro Gordo, Churubusco, and at the Belen Gate of Mexico City, where he lost his left arm. He finished the war as colonel in command of the regiment. In 1849, the Regiment of Mounted Rifles, with Loring in command, resumed its journey to Oregon. For the next twelve years Loring, and the regiment, saw duty in the American Far West: along the Oregon Trail, against the Mormons, and in many conflicts with the Indians of Texas and New Mexico. In command of the military district, which included New Mexico when the Confederacy was formed, Loring resigned his commission and journeyed to Richmond where he was immediately commissioned a brigadier general, C.S.A., and sent to command troops in western Virginia. During the following four years of bitter warfare, Loring served as a divisional and corps commander in many major battles and campaigns, east and west. He and his division were at Vicksburg, in the Tennessee and North Georgia campaigns of 1863 and 1864, and with Hood in his disastrous winter campaign against Nashville. Transferred to the east early in 1865, Loring and the remnants of his division surrendered to General William T. Sherman in North Carolina, shortly after Lee’s surrender to Grant in Virginia. For the next several years following the Civil War, Loring found himself making his living as an advisor on Southern investments for a group of New York bankers. He made a comfortable living, but the work must not have pleased him, because when he was offered professional military employment with the Egyptian Army in 1869, he accepted immediately. Hiring professional soldiers from other countries was not unusual in the 19th century. When former Union General William Sherman was on a visit to Egypt, he was asked by the Khedive for a list of American officers, Union and Confederate, with Civil War experience, who might be willing to accept service with the Egyptian Army. Loring’s was on e of the first names on the list, and the very first to accept a position. Loring served for ten years in Egypt. Initially concerned with training and coastal defenses, he took part in one active, ill-considered campaign against Abyssinia, today’s Ethiopia. Complications of the Egyptian command arrangements, realities that made his advice, influence, and experience useless, ultimately led to defeat for the Egyptian Army. Disgusted, Loring soon resigned his commission and returned to the United States. 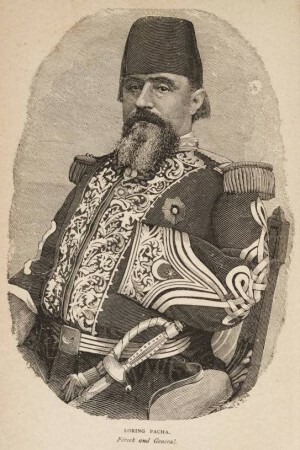 For the next few years, Loring wandered around the country, visiting friends and relatives and lecturing on his life as a pasha, or general, in the Egyptian Army. He wrote and published a book, A Confederate Soldier in Egypt, about his experiences. He began preparing his notes for a projected autobiography. It was not to be written. William Wing Loring died suddenly, December 30, 1886, in New York City.